At long last we're very excited to share with you what we've been working on the past few months. 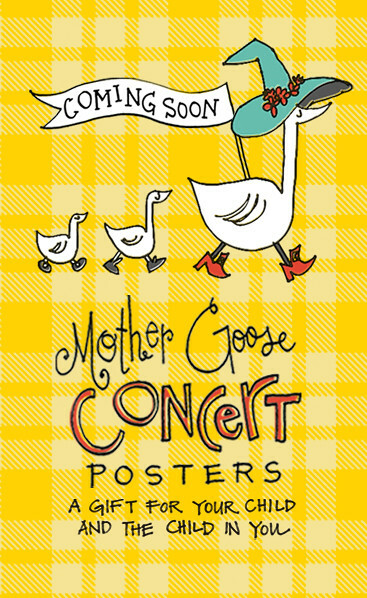 Next week we will be introducing the first three prints in our Mother Goose Concert Poster series! As is certainly the case with many families, when I was a little my mom spent hours teaching me nursery rhymes--expanding both my vocabulary and imagination. These fond memories have left a lasting imprint on my life, especially as I share this same tradition with my own boys. Drawing inspiration from this nostalgia, as well as the no-rules-world of gig posters, we've reinterpreted the traditional rhymes of childhood in a way that we hope, will not only appeal to children, but also to the child that lives within each of us; therefore living long past the diaper years as a cherished keepsake for adulthood. Aw, that's a cute idea! It's such a beautiful poster! Can't wait to see the series. :) Vintage meets modern, rhyme meets rock!